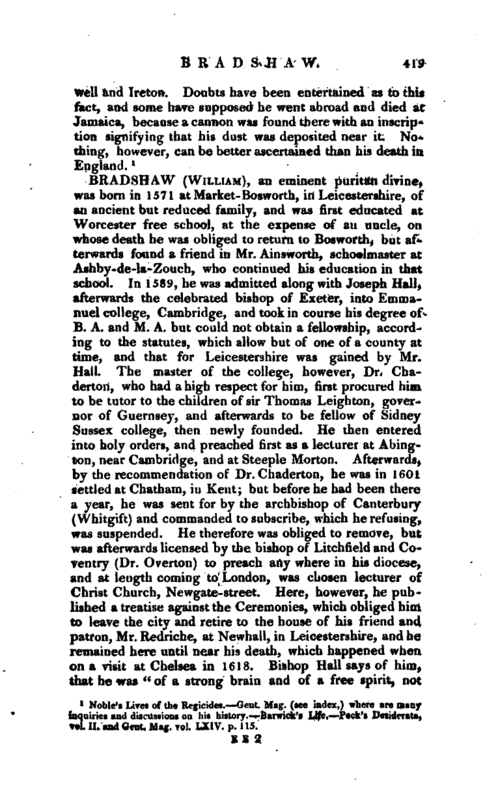 , an eminent puritan divine, was born in 1571 at Market-Bosworth, in Leicestershire, of an ancient but reduced family, and was first educated at Worcester free school, at the expense of an uncle, ou whose death he was obliged to return to Bosworth, but afterwards found a friend in Mr. Ainsworth, schoolmaster at Ashby-de-la-Zouch, who continued his education in that school. In 1589, he was admitted along with Joseph Hall, afterwards the celebrated bishop of Exeter, into Emmanuel college, Cambridge, and took in course his degree of B. A. and M. A. but could not obtain a fellowship, according to the statutes, which allow but of one of a county at time, and that for Leicestershire was gained by Mr. Hall. The master of the college, however, Dr. Chaderton, who had a high respect for him, first procured him to be tutor to the children of sir Thomas Leighton, governor of Guernsey, and afterwards to be fellow of Sidney Sussex college, then newly founded. 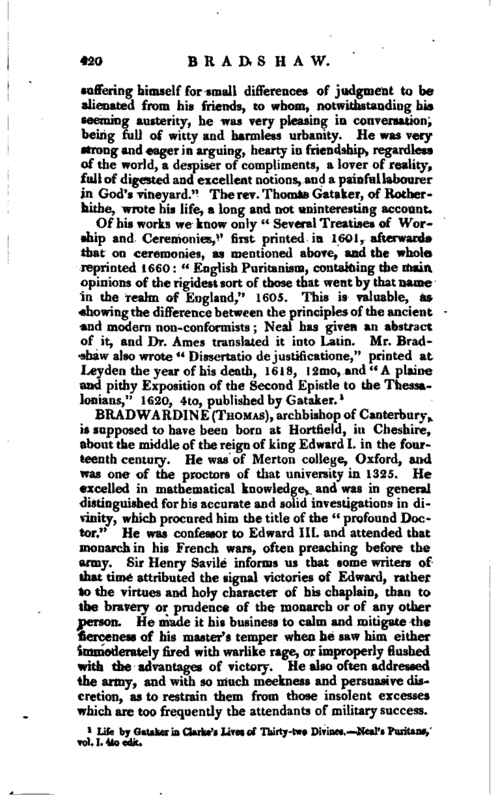 He then entered into holy orders, and preached first as a lecturer at Abington, near Cambridge, and at Steeple Morton. Afterwards, by the recommendation of Dr. Chaderton, he was in 101i settled at Chatham, in Kent; but before he had been there a year, he was sent for by the archbishop of Canterbury (Whitgift) and commanded to subscribe, which he refusing, was suspended. He therefore was obliged to remove, but was afterwards licensed by the bishop of Litchfield and Coventry (Dr. Overton) to preach any where in his diocese, and at length coming to London, was chosen lecturer of Christ Church, Newgate-street. Here, however, he published a treatise against the Ceremonies, which obliged him, to leave the city and retire to the house of his friend and patron, Mr. Redriche, at Newhall, in Leicestershire, and he remained here until near his death, which happened when, on a visit at Chelsea in 1618. Bishop Hall says of him$ that he was “of a strong brain and of a free spirit, not | suffering himself for small differences of judgment to be alienated from his friends, to whom, notwithstanding his seeming austerity, he was very pleasing in conversation, being full of witty and harmless urbanity. He was very strong and eager in arguing, hearty in friendship, regardless of the world, a despiser of compliments, a lover of reality, full of digested and excellent notions, and a painful labourer in God’s vineyard.” The rev. Thomas Gataker, of Ilotherhiihe, wrote his life, a long and not uninteresting account. Life by Gataker in Clarke’s Lives of Thirty-two Divines.—Neal’s Puritans, vol I. 4to edit.